The United States Mint released a series of five products on Thursday featuring 2011 American Gold Eagle Proof Coins. Started prices range from a low of $195 for the smallest offering up to $3,215.50 for a set containing all four coins. "Just in time for the spring graduation and wedding gift-giving seasons, the United States Mint offers one of its flagship products, American Eagle Gold Proof Coins," promotes the Mint on its website. "These coins are also a great way to honor that special person on Mother or Father’s Day. Last year’s coins sold out quickly, so be sure to act fast." The 22-karat American Gold Eagle debuted in 1986 with two types available — bullion versions intended for investors and proofs minted for coin collectors. The 2011 bullion eagles were released through the United States Mint network of authorized dealers on January 3. These coins do no carry a mint mark nor have a special finish. Each of the 2011 Proof Gold Eagle coins are available to anyone interested in buying them, as they are sold directly by the Mint to the public. Each bears the ‘W’ mint mark denoting their production at West Point and each features a frosted foreground and mirror-like background that most collectors prefer. Mintages and prices vary by coin size and set. 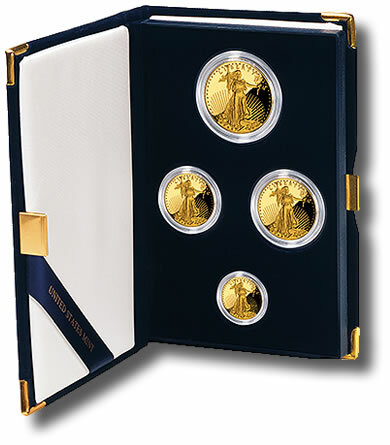 The 2011 American Eagle Gold Proof Four-Coin Set is packaged in a blue velvet, satin-lined presentation case and accompanied by a Certificate of Authenticity. The United States Mint reviews the price of gold weekly and, if necessary, will change the prices it charges for its gold coins. 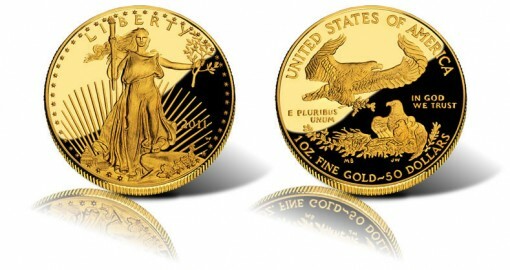 Current American Gold Eagle proof prices are based on a weekly gold average of between $1,450.00 and $1,499.99. When gold fluctuates below or above this range, the Mint will raise or lower coin prices. Each $50 gold shift will change the one ounce Gold Eagle price by $50, the half ounce by $25, the quarter ounce by $12.50 and the tenth ounce by $5. The obverse or heads side of every coin features Augustus Saint-Gaudens’ full-length figure of Liberty with flowing hair holding a torch in her right hand and an olive branch in her left. The reverse or tails side features Miley Busiek’s design of a male eagle carrying an olive branch flying above a nest containing a female eagle and her eaglets. All Gold Eagle proof coins are available online at the United States Mint website (http://catalog.usmint.gov/) and toll free number 1-800-USA-MINT (872-6468). No per household order limits are in place. The Mint indicates it will begin shipping them in one to two weeks. This April release is much sooner than the 2010 eagles which became available on October 7. The earlier launch may help extend their life. Last year the coins sold out before the initially promoted product and mintage limits were met. The Mint’s right, these really do make outstanding gifts. You get a car for graduation and all you do is sink more and more money into it over time. These, on the other hand, just grow money for a young grad. Great gift, great lesson.